Modern styling and tube sound in an integrated amplifier designed for the entry-Fi market. 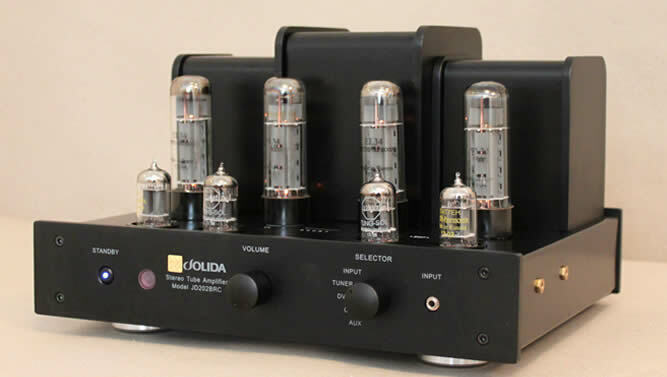 Versatile is the word that can be used for this amplifier. It has a price and sound that competes with solid state. The unit can be matched with a large variety of speakers and CD players. Setting up is simple, hook up a CD and two speakers and you have a music system that is perfect for your home, apartment, office, den or dorm. Now the enjoyment begins, the liquid, warm precise sound of how music should be listened to. Available in Black or Silver.If any Jolida shipment is refused and or returned for any reason including a possible defect and no defect is found a 25% restocking fee will be imposed. Sales Policy : All sales are final no returns accepted.If any Jolida shipment is refused and or returned for any reason including a possible defect and no defect is found a 25% restocking fee will be imposed addditionally customer will be responsible for all shipping charges to and from the shipping point.By placing an order you are accepting these terms. Free shipping applies to Domestic U.S. Locations only. o Fully Integrated Stereo Amplifier: Input 350mV driving 40 watts, maximum 50 watts output. o Top panel bias testing terminal with bias adjustment controls. jacks, gold plated five way speaker connectors.